Clickatell is a global, online SMS gateway providers which is worth considering if sending SMS overseas. View how the Clickatell SMS Gateway Australia service stacks up to its competitors nationally. Clickatell is considered to be a leading global mobile messaging service with over 1000+ global networks with a powerful API platform which allows business communications to be effectively and efficiently transmitted. Reviewing the range of gateway SMS providers in Australia, Clickatell is considered to be a global leader in the SMS Gateway space with a significant customer reach. It covers a wide range of networks in over 220 territories around the globe. From the extensive review of numerous SMS Gateway providers both in Australia and globally, it was reviewed that Clickatell uses direct telecommunication carriers such as Telstra, Optus and Vodafone within their gateway service in Australia ensuring high reliability in delivering text message promptly and effectively. Such direct, premium carriers ensures that text messages remain within the borders of Australia and that privacy and confidentiality are a priority. Therefore, such communications will reach any Australian mobile phone through their simple online SMS Gateway platform. Capable of delivering thousands of SMS per second. This SMS provider offers a full client email integration system without the need for any new software. Furthermore, it has a two-way communication system that will allow user-replies between customers or clients or employees from the company sending out the text messages to opening up effective communications which can be considered invaluable when it comes to staff rosters, notifications, alerts or appointment reminders. It is a Sydney based company with a support services within Australia for quick responses when it comes from a customer service perspective. Clickatell is considered to offer a good Service Level Agreement (SLA) which means there is a high level of reassurance from a guarantee delivery perspective. From a comparison of all gateway providers, it ranks highly for features among its competitors. Our Clickatell review found they are not cheap in terms of their pricing schedule among their SMS gateway competitors in Australia. 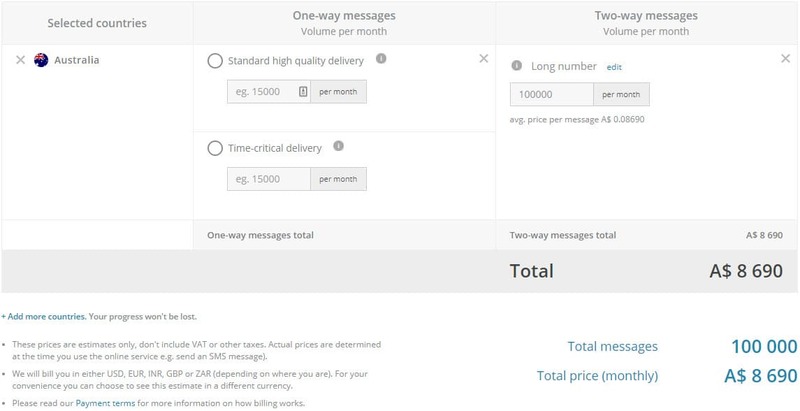 When comparing distribution for different volumes of text messages on a monthly basis, they it is more costly than their comparable SMS Gateway Australia providers. Based on the cheapest charges provided by other providers, Clickatell varies approximately between 8% to 25% more expensive but still comparable to some of the other providers’ charges presented in the table below. It should be noted that Clickatell does not offer unlimited credit availability and has a small charge per month for use of virtual numbers. They charge a subscription fee (one off). These factors will need some consideration when deciding on which company to engage. It should be noted it is not the cheapest provider with a credit availability of 120 days unlike its competitors which offer either 12 months or unlimited time. This may have an influence if you were to engage them. When comparing different SMS gateway providers, the ease and reliability are factors that require serious consideration when sending an SMS from a computer. Although Clickatell does not offering a full up-time guarantee like some of the other providers, it still does state that it has a 98% open rate. SMS is a universal mobile way to communicate as it operates on all mobile phones worldwide. It doesn’t matter what type of mobile people use. As Clickatell outlines in their overview, there is no need for messaging apps or texting apps. SMS can be sent with a simple integration with Clickatell SMS gateway API at any time. Their gateway systems is one of the largest SMS platforms in the world, and able to send SMS securely, reliably and very quickly when required and to whom is required whether it is with Australian mobile users or more than six billion end users around the world. Such reliability as a service provider makes such SMS distribution ideal for businesses and organisations whether small, medium or large. Again, Clickatell ranks well among its competitors with regard to reliability as a service provider. The Clickatell review disclosed it as a gateway provider service with a significant global market share competing with other major SMS players. It does display its clients on their website such as Telegram, IMDB, WhatsApp, Citix, Ikea, Ericsson and Target. Examples of companies that uses this SMS gateway provider are presented. It assist Deloitte customers by providing a secure SMS tip-off line to employees. Oanda Asia Pacific uses SMS to send price alerts to FOREX traders. Rolls Royce uses SMS to update customers on the latest industry news to ECollect using SMS notifications to contact debtors has established itself with a good reputation. Its customer care support service is limited to the business emailing a request for assistance and waiting a response. It does state it has a 24/7 support team available but no direct telephone or face-to-face discussion is offered. Close attention to local rules and regulations, employee-screening, and data encryption are just a few ways Clickatell ensures absolute security and reliability. They are General Data Protection Regulation compliant and have ISO/IEC 27001: 2013 compliant. SMS comparison table has established over six tears ago to compare text messaging services, price and features offered by SMS gateway providers. It was developed by a group of independent SMS practitioners who now do not work with any of these companies reviewed on this site. The team of reviewers appreciate the need to allow prospective and present clients and people to understand and review the options available when engaging a SMS gateway provider. The information provided is simple, easy to follow and displays in a comparative table format so as to provide you with key information on various selection criteria for your consideration. This site provides a guide only to prices, services and features and information may be updated by each SMS Gateway provider at any time without any notice in advance. Therefore, if you consider the information on this site to be inaccurate, the authors would encourage you to notify them so that such changes can be made promptly. This Comparison Table is provided for free of charge although there may be a commission requested from the provider if you use this site to engage their services.